I don’t cover conflict zones. I cover neither crime, nor corruption. I cover community building. That’s my jam. 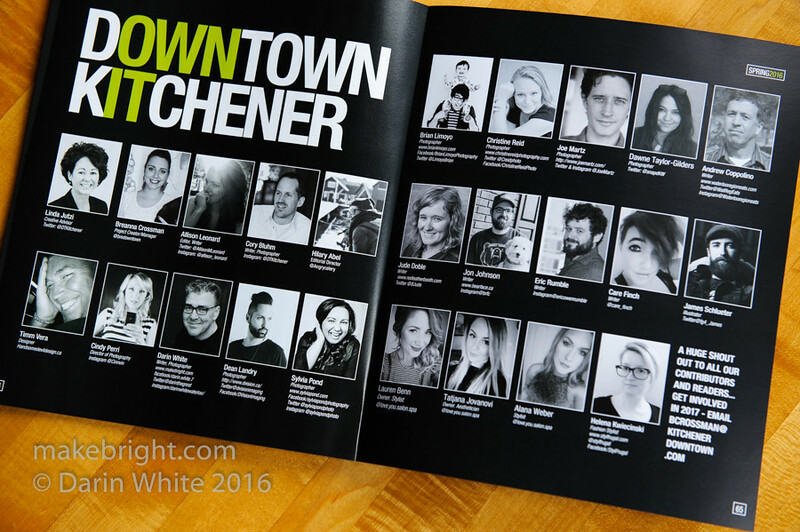 And to that end, I was super-delighted to contribute again to the second edition of the Downtown Kitchener BIA’s magazine OWNIT. Hearing that the print issue was out this week, I slipped down to Kitchener City Hall this morning to pick up a few copies. 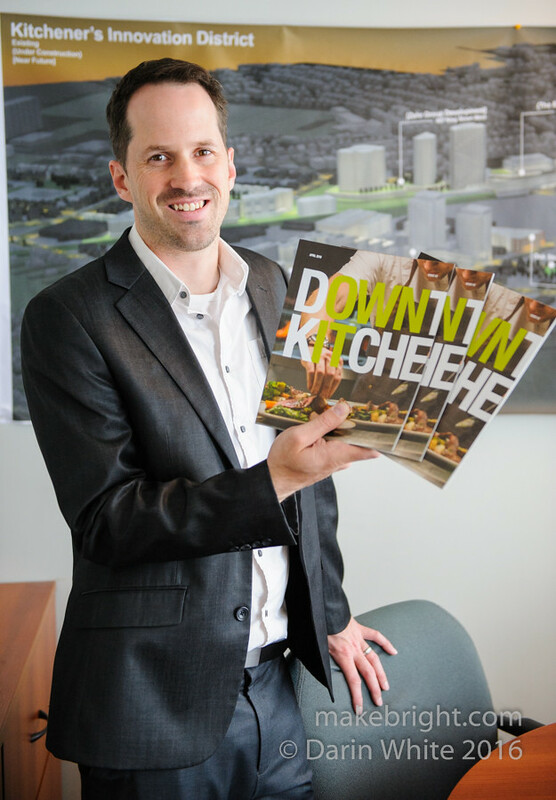 I asked the camera-shy Eowyn Spencer if I could take her photo handing over the magazines, and she strongly suggested Kitchener’s Manager of Downtown Development, Cory Bluhm (above) as the ideal model. Cory and I share overlapping philosophies on community building and what I respect most about him is that (a) he is out working at street-level, building connections, setting up tents and chairs at events, talking to people, shooting photos and (b) he vigorously eschews recognition like this, instead giving credit to the whole team. If you don’t know him, you should. 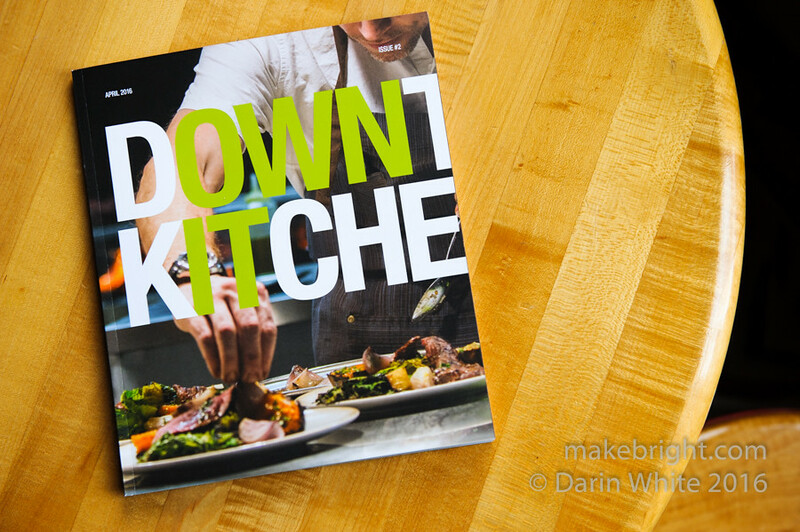 TL;DR: Step #1: get yer copy of OWNIT at the BIA office or in the Economic Development office at City of Kitchener or you can find a bunch of it on the web at DowntownKitchener.ca or on your fave social media channel (Facebook, Twitter, Instagram) Step #2: leave yer sofa, find the others. When I say “BIA” or “Business Improvement Area”, that’s too abstract. What I’m really saying is “all the businesses in the core of Downtown Kitchener” who pool their cash to make something happen. More concretely, that’s 570News, Ellison’s Bistro, Queen Street Commons Café, Apollo Cinema, King Framing, Big Fat Pita, House of Friendship, banks, doctors, lawyers, architects, tech companies and a whole lot more. Look at this photo: all those businesses and the people that make them go are right outside these doors. OWNIT magazine is not a marketing piece. I think of it as a reflection of what’s really happening downtown. It’s made by the people, for the people. I know many of the photographers, writers, graphic designers and connectors who worked on this issue. 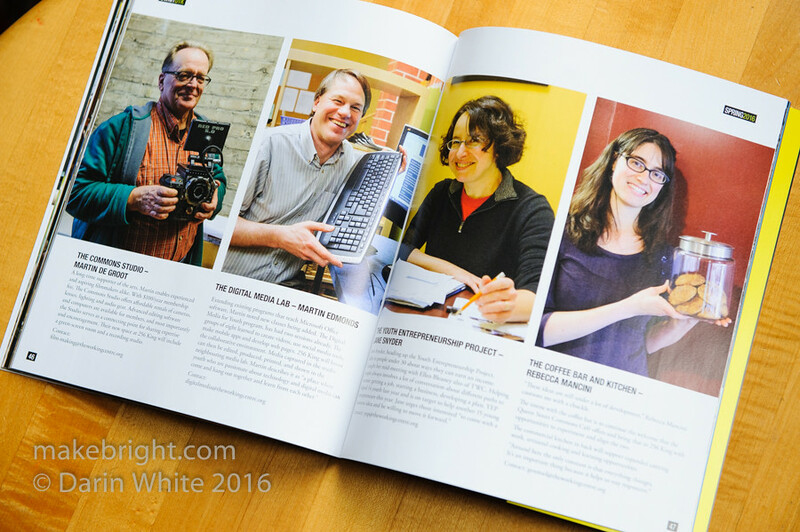 I know many of the people and businesses featured in the issue. 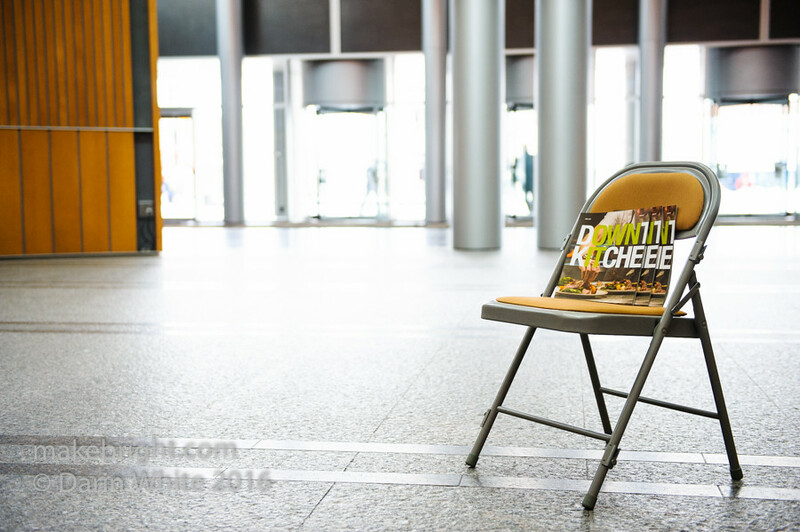 Put aside whatever perceptions you have of downtown, pick up a copy of OWNIT and see what’s up. If you don’t know The Working Centre, you almost certainly know a few of their programs. I caught up with Joe Mancini (right) as he toured Francis Mbewe of Zambia around TWC’s 256 King E project that will very soon offer 8 units of affordable housing upstairs and a new home for at least four programs throughout the rest of the building. Something I love most about my work is meeting the most interesting and passionate people and sharing a bit about them with you. 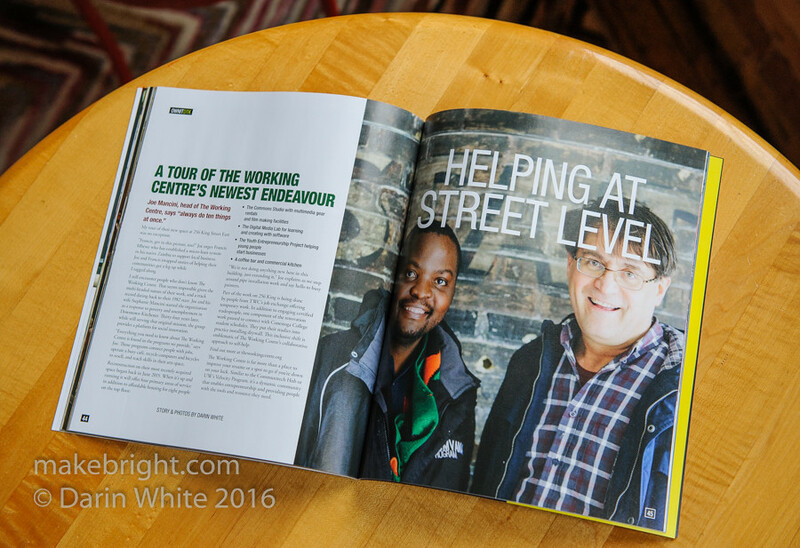 Initially this piece was to focus on the renovation at 256 King East, but after hearing Joe say The Working Centre is all about the programs they deliver, I knew I wanted to feature the people driving those programs. Here are Martin, Martin, Jane and Rebecca. What I honestly hope is that you will bump into them on King Street and say hello and ask how you can help with their work. The Working Centre helps people get work and there are few nobler things to do in the world. This crew has a very pragmatic approach to their work and a DIY ethos that resonates with the maker in me. No need to wait until 256 King E opens its doors, just hang out at The Queen Street Commons Café like I do and get plugged in while you get coffee. 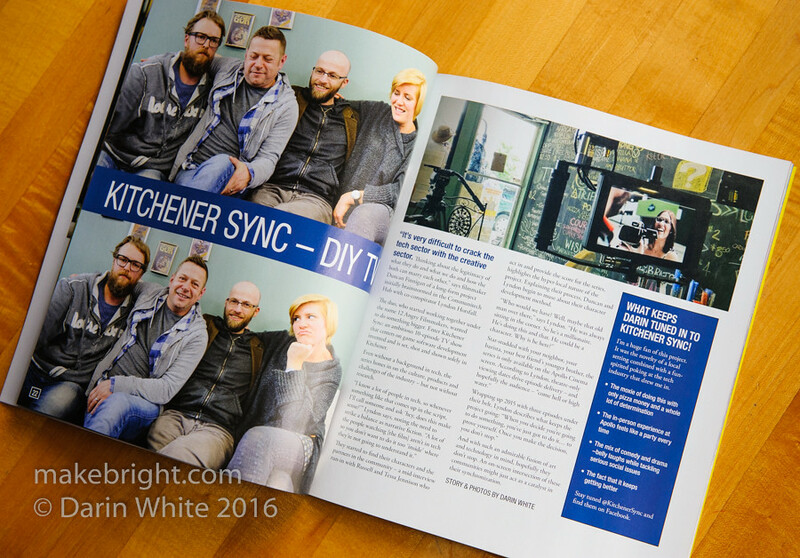 I don’t often crowd-fund, but when I do it’s usually something as gutsy as Kitchener Sync. This crew, led by Lyndon Horsfall and Duncan Finnigan are creating a 10-episode TV series and premiering each segment at the Apollo Cinema in DTK. It just feels like everyone in WR should know about this project. I was finally able to arrange a photo shoot with this busy duo and serendipity at The Adventurer’s Guild Café added in KS actors Russell and Tessa Jennison who also do the music for the series. Respect! Mega-meta! Here are the people that tell the stories and hook it all up. It’s fair to say this crew loves where we live and works hard to shape this community for the better. Now it’s your turn: what will you contribute? This entry was posted in community, shameless self-promotion and tagged Kitchener, OWNIT. Bookmark the permalink. Love this, especially the picture of my son, Cory, who does work very hard for the community. It may have been done, but how about a feature on Community Gardening. It is a growing phenomenon (no pun intended). I have helped to coordinate one since the year 2000, but there are many around the city. They are given startup help by the City, as well as churches, community centres, etc. We deliver extra produce to the House of Friendship, Kaljas homes and Anselma House. We also have a network facilitated by the Region of Waterloo. However, I just realized you need to be paid and while we are self-sufficient, we don’t have a lot of money. Keep up the good work though!